1. These Regulations are designed in accordance with Resolution of the Academic Board of Institute of philosophy and law of Urals branch of Russian Academy of Sciences of 22 January 2007 (protocol №1). 2. 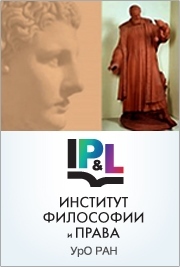 The Regulations are based on the requirements for peer review of scientific papers and other materials submitted to the Research Yearbook of the Institute of Philosophy and Law (hereinafter – the Yearbook). 3. Obligations to organize peer review of these papers shall be assigned to the Deputy Director for Science. 4. The Director of the Institute shall issue an order by which he shall appoint the Commission for organization of the peer review process. The Commission is headed by the Deputy Director for Science and includes the leading scientists of the Institute (hereinafter – the Commission). The Commission should consist at least of three members. 5. The Commission shall appoint peer reviewers and delivers to them papers for peer review. Members of the Commission may act as peer reviewers as well. 6. The Commission shall be entitled to invite as peer reviewers representatives from other academic institutions. 7. Review process shall be provided on a no-name basis. 8. Peer review of papers and other materials submitted is free of charge. 9. The Commission shall appoint two peer reviewers for each submitted paper. 10. The peer reviewers should specialize in a field which corresponds to the topic of the paper and have papers in this field published in the past three years. 11. The papers delivered to reviewers should not contain any personal data about the authors of these papers. 12. Peer reviewers prepare the review and send it to the Commission within the time period established by the Commission. 13. The review should be prepared in accordance with the form provided below. 14.Drawing on the reviews, provided by the reviewers, the Commission shall select those papers, which get the highest score within the quota, established for the Yearbook, and shall deliver these papers to the Editorial Board or the executive (academic) editor for academic editing. If the number of papers, which have received positive conclusions, exceeds the quota established for the Yearbook, a part of these papers, which exceeds the limits of the established quota, shall be included into reserve. The authors of these papers shall be notified of this fact by the Commission. The Commission may offer the authors, whose papers were included into the reserve, to submit their papers to another edition. 15. If the reviewers suggest to improve the paper, the author of this paper receives copies of the anonymous reviews. 16. Upon receipt of two negative conclusions the paper shall be rejected and shall not undergo further review. The copies of the reviews or rejection reasons should be delivered to the authors of the rejected papers within seven days from receipt of the reviews. 17. If the paper, included into the quota, needs improvement according to the suggestions of the reviewer, this must be done within the time period established by the Commission. By the decision of the reviewer the paper, revised by the author, is sent for further review. 18. If a submitted paper is withdrawn by the author, the Commission may ask the authors from the reserve to submit papers. By agreement with the authors the Commission establish the time period, within which the papers should be submitted. 19. Upon receipt of one positive and one negative conclusion the paper shall be sent to a third referee for further review. 20. As an exceptional case, the decision on publication of the paper shall be made by majority vote of the Commission members. If the vote is a tie, the head of the Commission shall cast the deciding vote. 21. The reviews of all the papers, submitted to the Yearbook, shall remain deposited in the Editorial Board and publishing office during five years. 22. By request of the Ministry of education and science of the Russian Federation the editorial board shall send to the Ministry copies of reviews as required.